This is Part 2 of the Suicide / Mental Illness podcast (Pt 1 Ep# 300). Gump relives his suicide attempt, Doug remembers the recently departed Uncle Bill, and Back Door Mike & CastleRock Kenny tell their lock up stories. 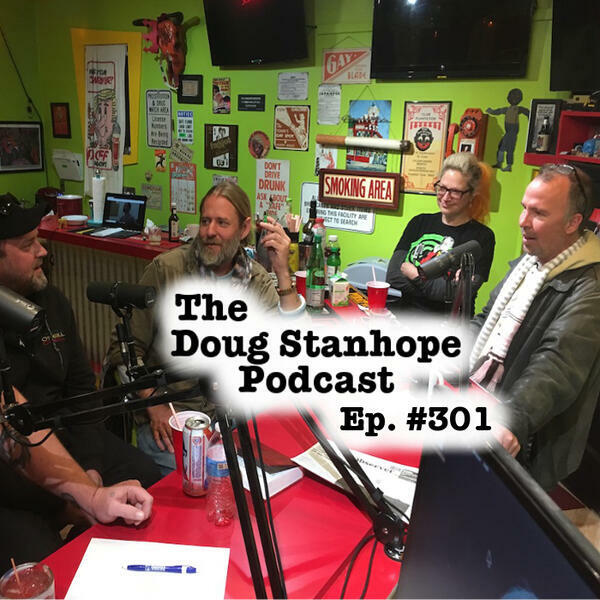 Recorded Feb. 23rd, 2019 at the FunHouse in Bisbee, AZ with Doug Stanhope (@DougStanhope), Jobi (@StanhopesCDP), Chad Shank (@hdfatty), CastleRock Kenny (@cstlrckkenny), Gump (@gump), and Ggreg Chaille (@gregchaille). Produced and Edited by Chaille. ButcherBox.com - ButcherBox offers 100% grass-fed and grass-finished beef, free range organic chicken, and heritage breed pork, raised free from antibiotic and hormones delivered to your door. Get $20 off your first box and 2 pounds of FREE Ground Beef in every box for the life of your subscription, go to ButcherBox.com/STANHOPE OR enter promo code STANHOPE.